The Home Depot – Stan Tashman & Associates, Inc.
Home Depot is replacing its US stores, Marc Powers, with another company veteran, becoming the latest major retailer to change the leader of its store operations. The spokesman said Mr. Powers wasn’t available to comment. Home Depot is the 3rd big US chain this month to change the executive in charge of its stores, as retailers grapple with what role their bricks and mortar locations should play while more shopping takes place online. The Home Depot said Monday it completed its $1.625 billion acquisition of Interline Brands, a national distributor and direct marketer of broad-line maintenance, repair and operations (MRO) products. The agreement to acquire Interline was previously announced on July 22, 2015. A few years ago, Americans who wanted to invest in China would have a lot of homework — and legwork – -to do. Most would have to hire someone halfway around the world to check out the investment for them. An investigator might drive for hours over the empty plains of Inner Mongolia, China’s far northern region, to make sure a remote mining operation really existed. Others would literally hide in the bushes to count trucks coming and going from a factory, or count the number of trees owned by a lumber operation. Now, companies have a much simpler solution: monitoring investments across the world through photographs taken from space. Satellite images contain a wealth of information about how much business a company is doing, and how much a country’s economy is growing. A hedge fund interested in investing in a Chinese miner, for example, might use the satellite images below to see how much the mine is really producing. By watching how a mine changes over hours or days, analysts can figure out how active the mine is. Analysts are now using satellite imagery to examine everything from the lights cast by cities in India, to black market activity in North Korea, to how many people are shopping at Home Depot. 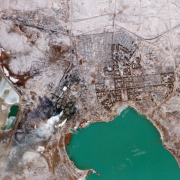 As satellite imagery becomes more available, it will reshape how companies monitor their own and competitors’ operations, and make investors huge amounts of money. It will also generate privacy concerns, as anyone’s activity outside is now visible to the highest bidder. ATLANTA, Jan. 16, 2015 /PRNewswire/ — The Home Depot®, the world’s largest home improvement retailer, today announced that its Board of Directors has elected CEO and president, Craig Menear, as chairman, effective February 2. He will succeed Frank Blake, who will retire as chairman. The Home Depot named Menear CEO and president in November of 2014. He is a 17-year veteran of the company, and is the first merchant to be named chairman and CEO since co-founder Bernie Marcus. The Home Depot is the world’s largest home improvement specialty retailer, with 2,269 retail stores in all 50 states, the District of Columbia, Puerto Rico, U.S. Virgin Islands, Guam, 10 Canadian provinces and Mexico. 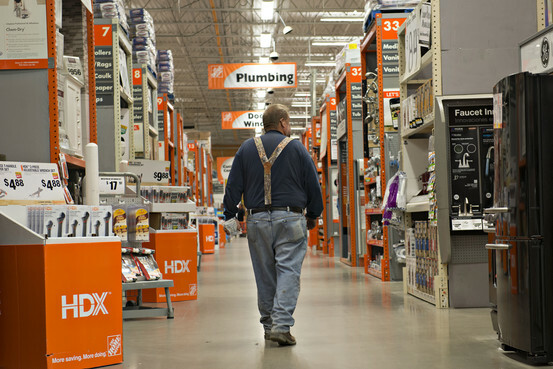 In fiscal 2013, The Home Depot had sales of $78.8 billion and earnings of $5.4 billion. The Company employs more than 300,000 associates. The Home Depot’s stock is traded on the New York Stock Exchange (NYSE: HD) and is included in the Dow Jones industrial average and Standard & Poor’s 500 index. Home Depot Inc. (HD), the world’s largest home-improvement chain, will start selling 3-D printers today in stores for the first time, pushing deeper into a market that was once the domain of engineers and hobbyists. Home Depot is selling devices from MakerBot, a 3-D printer maker acquired by Stratasys Ltd. (SSYS) last year, in 12 locations as part of a pilot project, the companies said. The effort will include stores in California, Illinois and New York. “It’s a pilot for us to test a potential disruptive technology, and to make sure we are on the forefront of a new innovative product,” Joe Downey, an online merchant at Atlanta-based Home Depot, said in an interview. Home Depot, the Place to Go for Toilet Paper? 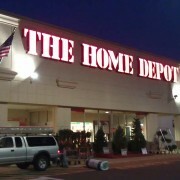 Social media marketer Valentina Monte stops by Home Depot HD +0.46% every two months. It’s her favorite place to buy toilet paper. The 23-year-old often buys books, clothes, shoes and concert tickets online and watches TV shows from Netflix NFLX +0.23% and HBO Go. But she still treks out regularly from her New York City apartment to visit the do-it-yourself store and stock up. It’s confusing, but it’s no accident. Home Depot Inc. is one of many unlikely retailers betting that consumer staples will boost sales and pull shoppers into their stores. While sales of most electronics and office supplies have rapidly migrated online, sales of soap and paper towels generally haven’t, making them magnets for foot traffic. 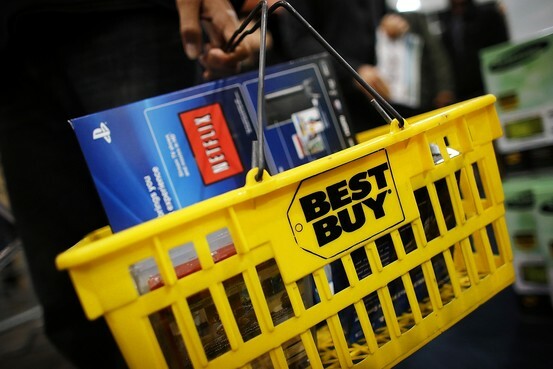 As a result, shoppers at Best Buy Co. BBY +1.29% don’t just find laptops and headphones. They can also buy Keurig coffee pods and Tide detergent. Customers browsing Staples Inc. SPLS +0.36% can pick up legal pads, but they can also find shaving cream and deodorant. Best Buy calls the strategy “floor optimization.” Staples calls it “Beyond Office Supplies.” Some shoppers call it puzzling. It wasn’t long ago that the largest American retailers had a simple strategy: Choose a category, build lots of huge stores and wipe out less-focused competitors. The lines are starting to blur. Staples’ marketing executive Alison Corcoran said expanding into deodorants and other goods that have to be replenished regularly is a logical step for the office supply giant. The chain is adding 1,600 new items, mainly business-related supplies, to its stores this year as it tries to reinvent itself and align with changing consumer tastes. A similar strategy is taking hold at Best Buy, which is trying to use consumables such as Tide, coffee pods and home soda machine supplies to bring back customers who once stopped by every week to buy compact discs, movies and ink cartridges. Scott Guthrie, who oversees SodaStream International Ltd. SODA +2.03% ‘s operations in the Americas, said nearly one-third of the people who buy soda machines will return to the same store when they need CO2 gas refills or syrup. Stores “love these planned visits,” because it increases the likelihood shoppers will pick up other items while in the store, he said. Home Depot: doesn’t sell cigarettes. Best Buy: doesn’t sell sneakers. Retailers are facing what may be a permanent drop in traffic as Americans increasingly shop online for everything from diapers to drywall. U.S. shoppers made 3.8% fewer shopping trips in 2013 than they did a year earlier, according to market research firm Nielsen, as strained consumers cut back trips to stores in part to spend less money on gasoline. Consumer products companies are encouraging the retailers’ moves, saying they have helped boost sales of their brands in an otherwise dour environment. Overall unit sales of consumer products have posted little or no growth in the U.S. for the past three years, according to Nielsen. Home improvement and office supply retailers have sold consumer packaged goods for some time, but they have been adding more items and marketing them more aggressively in response to growth in the area. Staples this year has ramped up efforts to portray itself as a source of such products, even replacing the bent staple “L” in its logo with items like a broom and dustpan, or a Windex bottle and a sponge. Nick Vlahos, chief customer officer at Clorox Co. CLX +0.22% , said home-improvement retailers are an important source of sales for the company’s namesake bleach, disinfecting wipes and Glad trash bags. “This channel in aggregate is driving more foot traffic,” he added. 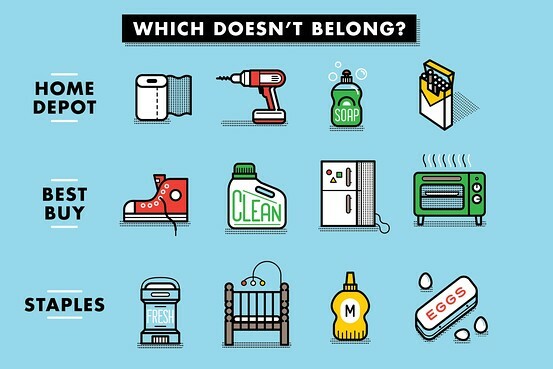 Clorox has also found, for example, when shoppers buy barbecue grills, they also tend to pick up bags of Kingsford charcoal, a product the company makes, or they may buy trash bags along with trash cans. Home Depot’s push into consumer staples came almost by accident, said the company’s U.S. retail president, Craig Menear. Employees in the garden department noticed cleaning supplies would boost the division’s sales in the winter, when customers weren’t buying potting soil and shrubbery, and suggested giving them more space. The company worked with Procter & Gamble Co.PG -0.10% to understand how to add cleaning supplies that would appeal to general consumers in addition to its professional customers. “Once we made it more visible, it became a growing category for us,” Mr. Menear said. This spring, Home Depot launched its own laundry detergent under its HDX label. Last year for Christmas, Ms. Monte, the social media marketer, asked her mother for a gift card to the home-improvement retailer. https://www.tashman.com/wp-content/uploads/2014/07/head-logo.jpg 0 0 tashman https://www.tashman.com/wp-content/uploads/2014/07/head-logo.jpg tashman2014-06-06 18:18:352014-08-07 00:34:53Home Depot, the Place to Go for Toilet Paper?